There’s something about headlights casting shadows on the road at night that stimulates the imagination. Roads, especially dirt roads with no streetlights, reveal shadows that could contain any kind of mystery—a wild animal, a ghost, a malevolent cult, anything strange and threatening. Of course, if you happen to be driving along such a road with a group of friends, the tales get all the wilder. 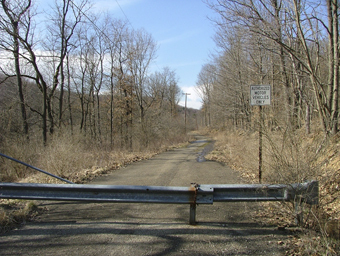 And that’s exactly what has happened with Blue Mist Road in Pittsburgh’s North Park. To some, the mystery is more important than the mist, and they spell it Blue “Myst” Road. The legends that surround this stretch of road are as varied as western Pennsylvanian imagination. Like the Trojan War or Mount Olympus to the Greeks, it has become a convenient receptacle for any tale, ranging from obvious campfire yarns and recycled urban legend to legendary material with more heft and style. But always, it comes back to a rolling mist that appears at night, on a dirt road near the lake in North Park. After the mist rolls in, the tales diverge in the woods. The classic local legend about Blue Mist Road is that the KKK used to hold rallies there at night and would lynch people on a gnarled tree by the side of the road. It’s a good scary tale, but it lacks the ring of truth. Given the strong, centuries-long abolitionist tradition in the Commonwealth, it seems unlikely that a group like the Klan would have established a stronghold here. Besides, the tree that’s most often associated with this tale seems to be singularly unsuited to the task, with no strong low-hanging limbs to throw a rope over. occupied by a witch and another, called the Midget Farm, by a little person. All the usual Midgetville stories applied to this house, including the one in which groups of angry and armed little people would attack your car. As far as we can tell, these tales are just good ways to scare your carmates, though apparently a resident of one of the houses would load rock salt into shotgun cartridges and fire them at nighttime trespassers. This type of attack is loud, scary, and will cause expensive damage the paintwork of a car. But it causes no serious personal injury...at least, nothing more serious than you’d get from falling onto an asphalt surface. It stings, grazes, and teaches you a lesson without causing actual bodily harm. 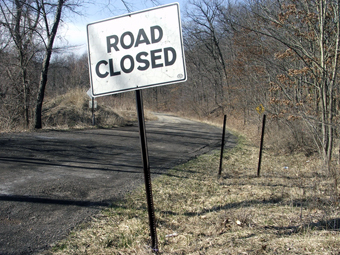 The lesson in question is “Stay away,” a message that is reinforced by the Road Closed signs at both ends of the street. Nevertheless, people do drive and hike down the road at night, and drivers claim that if you park and honk your car horn three times, the engine won’t start up again. When you consider that people live off the road, it’s antisocial to honk your horn at night anyway. All of these stories are pretty much standard fare for the nighttime traveler with a car full of thrill-seekers. But one is a little more unusual. There is a cemetery near the road with tombstones that lean toward each other. They say that the occupants of the graves were thwarted lovers, and that the stones are trying to kiss to consummate the love between them. In some tales, the stones actually do meet once a month on the night of the full moon. In other variations, the stones do not meet, because if they did, it would bring about the end of the world. 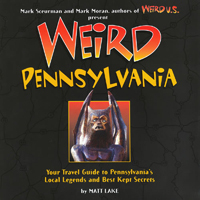 To read about a Pennsylvania “Road Less Traveled” near you, pick up a copy of Weird Pennsylvania.